On what would have been Jose Fernandez’s 25th birthday, his friend and Washington Nationals pitcher Gio Gonzalez stepped onto the mound at Fernandez’ old home, Marlins Park in Miami, and pitched a gem befitting of the Marlins’ erstwhile ace, throwing eight innings of no-hit ball, and striking out 5. Fernandez, who died in a boating accident last September, was remembered by the 18,962 fans in attendance, including his daughter, mother and grandmother. Gonzalez was pulled in the ninth after conceding his first hit, a leadoff single by another of Fernandez’s good friends, Marlins second baseman Dee Gordon, and left the field to a standing ovation from the watching crowd. Gonzalez choked up while talking about Fernandez in a post-game interview, saying “today was just a special day, an emotional day,” and described how he had warmed up for his start using a special baseball bearing Fernandez’ number, 16, and his initials. The only offense in the game came in the sixth inning, when Nationals center fielder Brian Goodwin led off the inning with a double and came in to score on a Bryce Harper single. 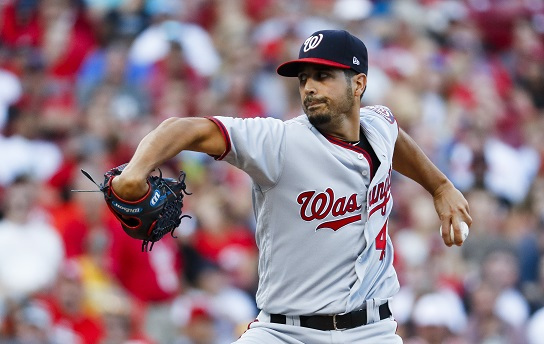 But that would be all the Nationals needed in their 1-0 victory, as closer Sean Doolittle finished what Gonzalez started, throwing a scoreless ninth. With the win, the Nationals (63-41) increased their lead in the National League East over the Marlins (49-55) to 14 games.